Israeli authorities issued a military order, on Monday, to extend the period of the closure of roads, leading to the Bedouin village of Khan al-Ahmar, east of Jerusalem district in the central occupied West Bank. 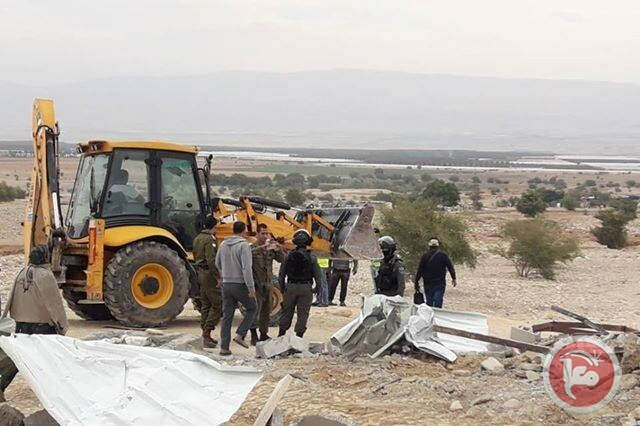 Israeli forces demolished two houses in the al-Fasayil village north of Jericho City in the northern occupied West Bank's Jordan Valley area, on Monday morning. Head of the al-Fasayil village council, Ibrahim Abu Awad, condemned the demolition carried out by the Israeli authorities. 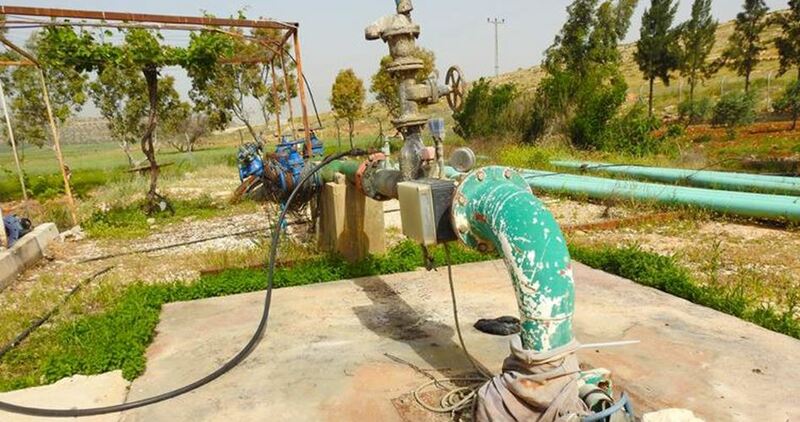 He identified the owners of the houses as Ayman Youssef Qureinat and Hassan al-Zayid, pointing out that both families consist of ten members, who have become hopeless. Abu Awad called for immediate protection for Palestinians of the Jordan Valley region. 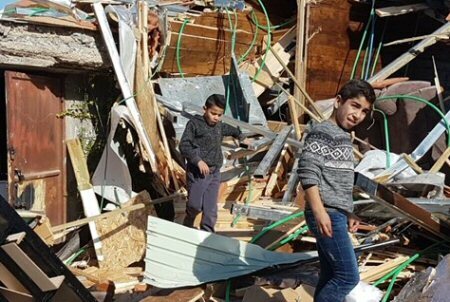 The Israeli Occupation Forces (IOF) ordered on Monday three Palestinians to demolish their homes in the Yatta-area village of Umm al-Khair, in the south of the West Bank province of al-Khalil. 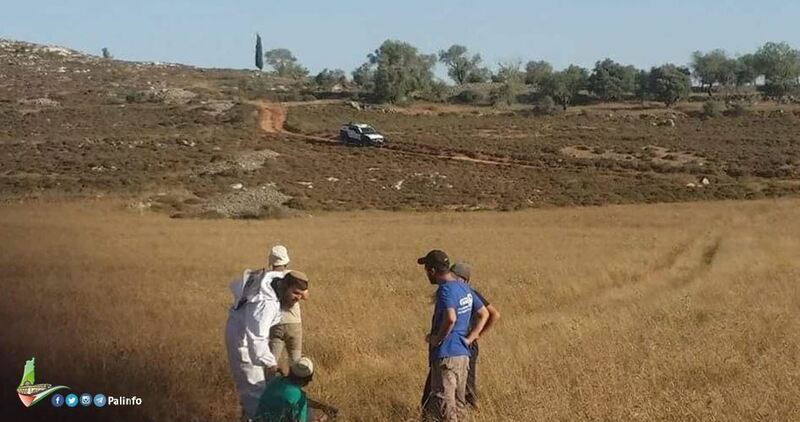 According to the local activist Rateb Jabour, the IOF handed the three residents from the Hathalin family demolition orders for construction without permit. 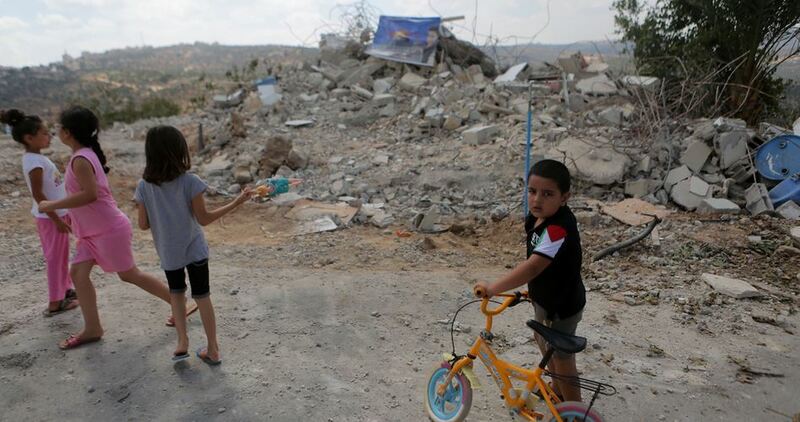 Jabour strongly condemned the Israeli demolition and displacement policy which aims at extending the neighboring Israeli settlement of Karmiel. The Israeli occupation forces on Monday demolished Palestinian houses and sheep brans in the northern Jordan Valley. Anti-settlement activist Aref Daraghmeh said in press statements that large Israeli forces stormed Fasayel village and demolished residential facilities and sheep barns owned by Bedouin families there. Daraghmeh added that the Israeli forces raided a number of Palestinian houses in the same area on Sunday evening and seized about 50,000 NIS. 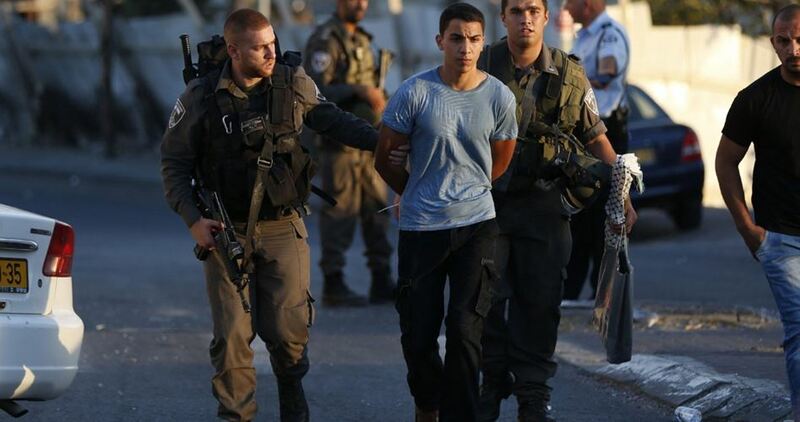 The Israeli occupation forces (IOF) at dawn Monday arrested 17 Palestinians, including ex-detainees, in large scale campaigns in the West Bank. The IOF raided Tulkarem, searched dozens of Palestinian houses, and arrested five Palestinian citizens. Local sources reported that violent clashes broke out in the area during the IOF raid. Meanwhile, the IOF arrested a Palestinian youth in al-Am'ari refugee camp in Ramallah after searching his family house and assaulting his family. The IOF arrested another Palestinian in Jifna town, north of Ramallah, and confiscated his car. According to local residents, six Palestinian ex-prisoners were arrested during Bethlehem sweeps. At the same time in al-Khalil, the IOF arrested two children, raided and searched a number of Palestinian houses, and handed an ex-prisoner an order to appear before the Israeli Intelligence Service for interrogation. The sound of Jewish settler bulldozers as they sweep and dig rocks to build infrastructure for five settlement outposts surrounding the village of Jalud, south of Nablus, is always heard. This has caused the loss of agricultural and pastoral land of the village, which has been plagued by Jewish settlements. Abdullah Mohammed, the head of the village’s council, confirmed that the Israeli bulldozers continue to raze the village’s land on which many settlement outposts are built, as well as the construction of new roads, water reservoirs on the high mountains and housing units. He added that the village is no longer able to bear the losses caused by the settlements. It has drained the majority of the village’s land, where the settlements’ expansion does not stop, with the aim of establishing a very large settlement bloc in the area. As for why the Israeli occupation concentrates on settlements south of Nablus, researcher Khalid Maali said that this is due to the presence of ancient monuments which religious extremist settlers think come second in importance to that of occupied Jerusalem, as well as because of Jalud’s geographic and strategic location as it is located in the middle of the West Bank, north of Ramallah and east of Salfit and south of Nablus. 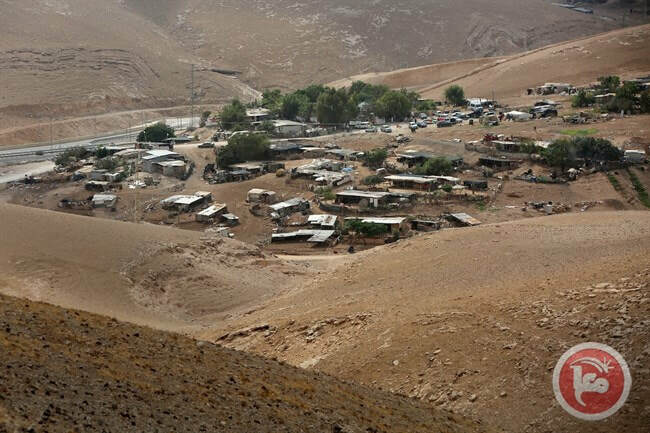 Ghassan Daghlas, the official in charge of the settlement profile in the northern West Bank, said a new settlement outpost had been established on the lands of Jalud village, south of the village school, where settlers erected a large tent and built wooden rooms in the area. 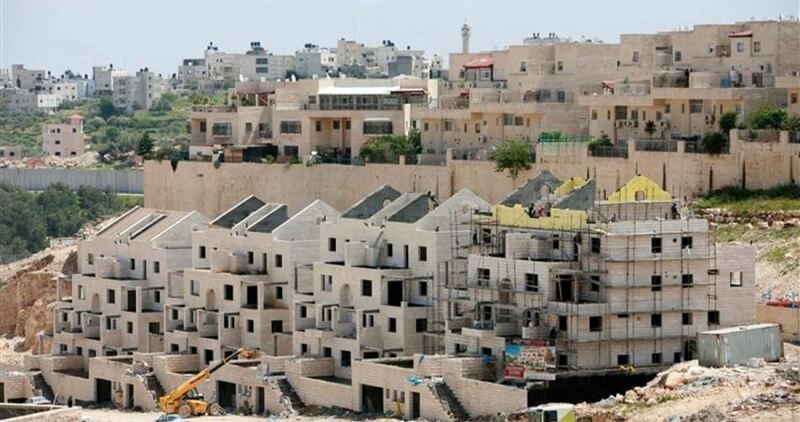 He added that settlement expansion is taking place in five sites in the lands of Jalud, such as in the settlements of Shvut Rachel and Amihai al-Jadida, where construction work is underway for building new houses and infrastructure. At the same time, construction work is taking place at the outposts of Hayah, Ish Kudash and Kida, in addition to the construction of settlement outposts outside these outposts in order to expand them at the expense of Palestinian lands to bring more Jewish settlers in. The settlements and outposts built on the lands of the village of Jalud, south and east, witnessed an unprecedented construction, bulldozing and settlement expansion in order to impose facts on the ground before the official declaration by the occupation authorities of legitimizing the five settlement outposts, thus forming of a huge settlement bloc on an area of more than 8 km2 of the lands of Jalud, which is classified as area C of the West Bank. Jalud is a Palestinian village located 26 km to the southeast of the city of Nablus. It is located 790 meter above the sea level, and it is part of the Nablus governorate. Its lands are surrounded by the villages of Qasri, Qaryut and al-Mughair. Its population in 1922 was estimated at 124. In 1945, there were about 300 people living in the village. Israeli bulldozers demolished on Wednesday morning a Palestinian-owned building in occupied Jerusalem, for being allegedly built without permit. 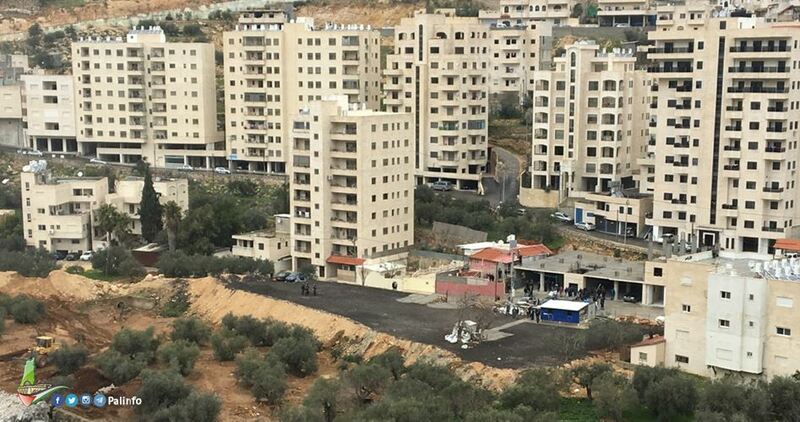 Local activist Rasem Obaidat said that Israeli police forces stormed Jabal al-Mukkaber neighborhood early today before starting demolishing a local building owned by al-Maghrbi family. 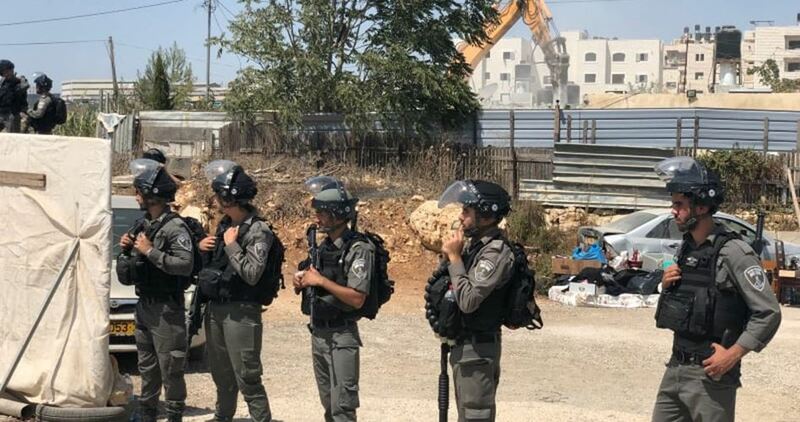 Dozens of Israeli military police cordoned off the neighborhood and deployed in the alleyways as municipality bulldozers proceeded to demolish the building under the pretext of being built without a rarely-issued Israeli license, Obaidat clarified. Israel's Supreme Court has issued a decision providing for transferring the ownership of over 500 dunums of Palestinian-owned land near Gush Etzion settlement, south of Bethlehem, to the Jewish National Fund, Israel Hayom newspaper said on Tuesday. The paper reported that the Supreme Court earlier this week rejected an appeal filed by the Palestinians against a court decision stipulating that the Jewish National Fund is the owner of these lands. The court decision gives Israeli settlers the authority to build hundreds of settlement units on the seized lands which cover an area of 522 dunums (a dunum equals 1,000 square meters). The Jewish National Fund is a Zionist organization founded in 1901 to raise funds from the Jews to seize Palestinian lands and establish Jewish settlements there. The Jewish National Fund's work continued during the British Mandate and even following the 1948 and 1967 wars. There are 127 settlements and 116 random outposts in the West Bank inhabited by about 450,000 Israelis, while Jerusalem alone has 15 settlements where 220,000 Israelis live. Israeli occupation bulldozers demolished on Wednesday morning a Palestinian residential facility south of occupied Jerusalem city under the guise of unlicensed construction. According to eye-witnesses, Israeli municipal crews escorted by police troops, rolled into al-Abeidat neighborhood, in Jabal al-Mukabbir town, and closed off vital thoroughfares. 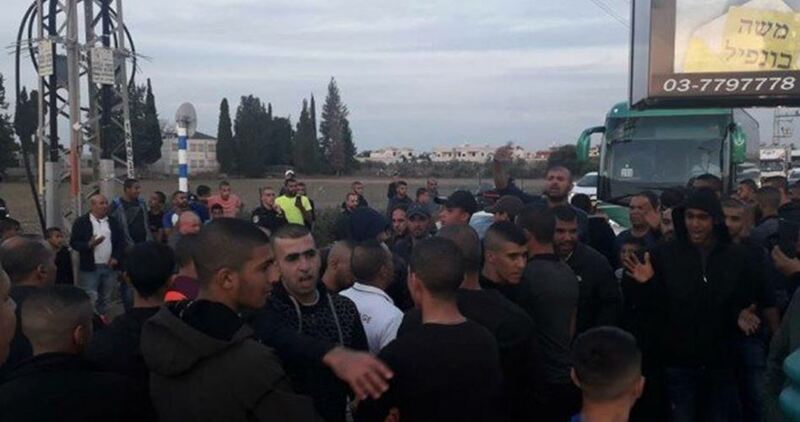 The occupation forces cordoned off a home belonging to the Maghrebi family and forced the inhabitants out after they violently beat up the family members. The bulldozers turned the building into mounds of rubble without prior notifications and under the pretext of unpermitted construction. Journalists were also denied access into the demolition scene by the occupation police.